Learn more with our informational page about the definition of vortex flow meters and its principles. The FV-200 Series meter utilizes vortex-shedding technology to provide a repeatable flow measurement accurate to 1% of full scale. The meter has no moving parts, and any potential for fluid contamination is eliminated by the meter's corrosion-resistant all plastic construction. The meter includes a compact 2-wire (4 to 20 mA) or 3-wire pulse transmitter (optional), contained within a conveniently replaceable plug-in electronics module. All electronics are housed in a corrosion-resistant enclosure. Unlike meters containing metal or moving parts, the FV-200 is perfect for aggressive or easily contaminated fluids. Applications range from ultra-pure water to highly corrosive chemicals and slurries. Operation of the FV-200 vortex flow meter is based on the vortex shedding principle. As fluid moves around a body, vortices (eddies) are formed and move downstream. They form alternately, from one side to the other, causing pressure fluctuations. These are sensed by a piezoelectric crystal in the sensor tube, and are converted to a 4 to 20 mA, or pulse signal. The frequency of the vortices is directly proportional to the flow rate. This results in extremely accurate and repeatable measurements using no moving parts. Another advantage of utilizing a FV-200 vortex flow meter is that there are no gaskets or elastomers in the meter. Therefore, one need only be concerned with the thermoplastic material used in body construction. In a thermoplastic piping system, the material chosen for the flow meter should match that of the pipe wherever possible. Many factors may affect the capability of a meter to measure the flow of specific fluids accurately. Different solutions have varying effects on meters. For instance, heavy particle suspension will wear down internal parts on some meters or cause sensing inaccuracies for non-obtrusive metering systems. 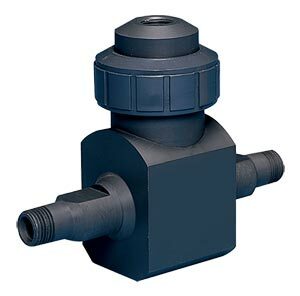 For vortex flow meters, high viscosities tend to dampen the formation of vortices and reduce the effective range. Particles and internal bubbles do not usually affect vortex meters. Slurries containing grit can wear down the bluff body over a period of time. Also, long fibers can catch and build up on the bluff, decreasing accuracy. Standard factory calibration is for tap water at 32 SSU (1 cSt) viscosity and ambient temperature. Viscosity above 1 cSt will raise the minimum readable flow rate, reducing rangeability. The effect is linear to viscosity. No adjustments are required for specific gravities up to 2.0. Liquids with high specific gravities will adversely affect the permissible amount and duration of over range flow. 참고: Comes complete with 5-point NIST certificate and operator's manual.